This special relationship of people and fields started over one hundred years ago. 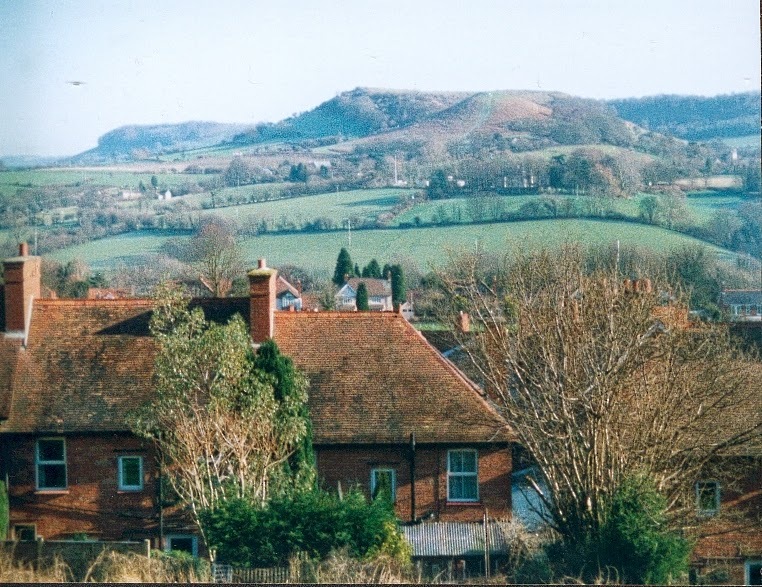 Garden Suburb houses were built in Dursley between 1908 and 1910, on low slopes of escarpment fields, beneath hillside woods. One row had two alleyways, giving access to meadowland at the back. Diana Barton was born, at Number 10, in 1920. Once old enough, she was out there, following the established pattern of local children, playing with friends, making dens, gaining wonderful, outdoor experience. She was my mother. Born in July 1945, I too grew up at Number 10. My friend’s garden bordered the fields, neighbourhood children continued to play there. My children grew up at 53, making them, with other local children, a third generation, able to enjoy everything the open green space behind our houses had to offer. With post-war change to much easier lifestyles, parents and grandparents gained time to join in with leisure activities and the fields became a meeting ground for entertainment between family groups. Nobody was ever approached by a landowner. In 2010, contractors appeared, stripped the fields of all surface growth and decimated wildlife. Huge bonfires burnt for weeks. Shrubs at the woodland edge deemed not a hedge were removed. The landowner organised Dursley town council to re-fence their wood and circulated his intention to introduce horses. Field- use by neighbours continued as ever, avoiding contractors, but the motive was questioned, and doubted. However, nothing further happened. If any of us had known about Town Green status, we would have applied then. Just before August Bank Holiday, 2013, copies of a pre-planning proposal, for 69 houses on two fields off Hardings Drive, Dursley – those behind Garden Suburb - were hand-delivered from Snooks Planning Consultants, on behalf of clients, to all properties adjoining the fields. They omitted to notify Dursley Town Council, as owners of adjacent woodland and gave residents a paltry seven days, to respond with opinions. Following complaints, the time was extended. These are Cotswold edge escarpment fields, within the AONB (Area of Outstanding Natural Beauty) and compose the only open green space visible from Parsonage Street, in Dursley town centre. Their part in creating the town’s pleasant rural aspect and ambiance is vital. Replacing these green fields with a housing estate would completely ruin the appearance and nature of this town. On 29 August 2013, residents from Torchacre Rise, Hardings Drive, Cedar Drive, Garden Suburb, Burnt Oak, Westfield and other areas, met at the Kingshill Inn to begin an Action Group Campaign. Over 70 local people attended, giving support and help to fight any proposed development. Memberships were taken and a steering group formed which met to establish the forward process. It quickly came to light that one member had been involved with a Town Green application and after research, he thought the considerable use locals made of the fields, beyond the required 20 year period, ‘as of right’, without hindrance or permission, qualified us to apply. The process would delay any planning application until finalised, success would give the fields their best possible protection. The immediate glitch was new rules for Town and Village Green applications from 1 October, 2013, would make this status more difficult to achieve. We had two weeks to write as many witness statements as possible, supported by photographic evidence and apply under the old rules. Love of the fields, passionate that they stay as open green space and community spirit kicked in. We went for it, found an amazing solicitor, who checked legal aspects in our endeavours, achieved copies of everything, made sure we were as presentable as possible and charged nothing! No time to organise a community pot, anyway! Our application was hand-delivered to Legal Services, Gloucester, at 2 pm on Monday 30 September 2013, the last day! Between us, we recorded a fabulous array of field activities for the requirement of comprehensive use over the previous twenty years, with some of our long-term residents able to go much further back than required. Naturally, there are all the usual events of daily walkers with and without dogs, adult walkers with and without children. But we have a history of unaccompanied children using the fields for play and learning, den-making, sporting games, games of imagination. Children at play all day, safe in the knowledge that they are free to do so, with home in easy reach if wanted, parents supplying picnics, children within easy call when they had to come in. There have been organised events, team games of cricket and football, kite-flying, birthday parties, bonfire parties, November the 5th celebrations with fireworks. Tents have been put up and children have camped overnight without adult intrusion. From the first appearance of good snow, it’s a steep slope, scream-inducing, fun-fair toboggan ride. Teaching the ways of wildlife and encouraging children to grow up revere our countryside landscape and preserve its legacies for future generations, is high on the list of importance for so many parents and grandparents who have accessibility, on their doorsteps, by living in a spectacular rural area. The fields off Hardings Drive are loaded with exciting wildlife for adults and children to seek out and enjoy together. We have bats, foxes, badgers, squirrels, an array of mice, shrew and vole prey items for raptors, many amphibians, frogs, toads, palmate and common newts, slow worms, birds of woodlands, birds of fields, butterflies, caterpillars, grasshoppers, crickets, shield bugs, other bugs and beetles, plus three types of deer with regularly produced fawns. The One Show nature team visited the site in 2008, stayed longer than scheduled as wildlife was so impressive and put out a prime-time television programme as a result. Bird watching is a serious hobby for many people who walk this lovely area. So is landscape appreciation. Walking from Hardings Drive, the fields rise steeply and the view opens up behind. Turning, reveals the hanging valley Dursley nestles in, a landscape of surrounding Cotswold scarp slopes, bordered by beautiful hills, clockwise from Cam Peak, Cam Longdown, Downham, the south face of Uley Bury, showing its Iron Age defences, then miles of woods and escarpment fields curving round from Uley village. No wonder, then, between wildlife and landscape, these fields have huge attraction for amateur and more professional photographers. Owners of Clifton Cameras, Dursley, have just moved premises to double their floor space. Customers are directed in the street, to focus their prospective purchases on Hardings Drive fields. In rain, an assistant holds the umbrella! Trish Andrews is not a Green Party member but asked us to share this blog to raise awareness of the issues.